Winner of a BBC World Music Award and nominated for a Latin Grammy, Chango Spasiuk returns to Britain with an autumn tour, calling in at The Apex on 14 November. At home in Argentina, Chango Spasiuk is considered the new hero of chamamé, the music ‘with the deepest swing in Argentina’! A fiery and sensitive virtuoso on his accordion, Chango brings rare charisma to his live performances: his rapt, dervish-like stage presence and his extraordinary ensemble make for music of profound beauty and feeling, infusing melancholy with resilient optimism. Chamamé is a warm-hearted, accordion-based style that formed as the result of a mix between various Spanish musical forms, Central European popular dances, African rhythms, and roots from the region’s indigenous Guarani people. The genre was born in the countryside and is strongly associated with rural life and, originally, the ‘peasant classes’. Its natural home is the red lands and lush jungles of north-east Argentina, where Spasiuk was born to a family of Ukrainian immigrants. With European dance forms such as polka and mazurka at its heart, but with a familiar Latin feel, Chango’s music is likely to appeal to fans of European ballroom and folk dancing, as well as fans of Latin music and dance. Chango Spasiuk’s main instrument, and the quintessential instrument of chamamé, is the accordion. Chango’s popularity at home in Argentina has been growing in recent years, where he is admired as a kind of ‘anti-hero’ hero, giving non-commercial, and more specifically folk music, new ‘cool’ credentials. His rising profile is much down to his work on TV where he has been the host of a long-running series called ‘Pequenos Universos’ on ‘Canal Encuentro’. In each episode he travels to a different part of Argentina discovering local traditions meeting with local musicians, and playing with children learning the styles at home or at school. Chango Spasiuk plays at The Apex on Monday 14 November at 7.30pm. Prices are £12.50, with £5 tickeys for those aged under 25. 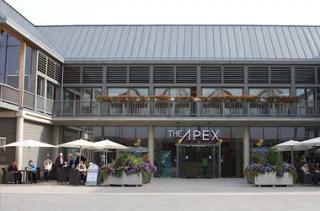 Ring the box office on 01284 758000 or see the website - www.theapex.co.uk - for details.